When it comes to running direct mail campaigns, quality wins over quantity. It’s much better to do small print runs of highly targeted, personalised material, than send out something completely generic to the masses, that ends up going straight in the bin. Direct mail certainly isn’t dead, despite what some people say, and can make a huge difference to your bottom line, whatever sector you’re in. It has a huge influence in the 3rd sector in particular. The 2015 DMA Response Rate Report, showed that direct mail outperforms all digital channels combined by nearly 600%. Having a good mailing list is essential and should never be underestimated. Building your own list is always preferable to buying one in, especially if you’re going to be targeting senior people within an organisation. Your mailing needs to make it past the gatekeeper, the secretary or PA, so needs to look important. One well-known HR company, achieved great success by designing their DM to look and feel like a payslip. It made it into the hands of the people it was meant to, intrigued them and resulted in thousands of pounds worth of new business. Testing is so important with any campaign. Don’t make presumptions. Compare different designs, copy, imagery… make every campaign the best it can be. Analyse the results and learn from them.. Learn from others, keep any direct mail you receive at home, and in the office. Encourage others in your team to do the same. If a piece stands out, grabs your attention, keep it to one side. Is there anything you can replicate/build on? What do your competitors do? Is there an industry magazine or newspaper the people you’re targeting read regularly, for instance the Financial Times? Advertising in these publications may be beyond your budgets, but could you cleverly insert a piece of direct mail into a copy, perhaps addressing them personally and deliver it to their office/headquarters? If it’s done well, it can look seamless and have a big impact. Don’t do what everyone else is doing, if you want to include a giveaway. A branded pen or mouse mat is hardly going to set the world alight. Choose something that requires the person to do something that you can track, that makes them find out more about your products/services by visiting your website. If it allows them to try what you’re selling, even better. For instance, a B2B rewards business that offers company branded gift cards for staff rewards/long service awards, included a branded gift card in every piece of direct mail, which had been loaded with a mystery amount. To activate it, and find out how much was on it, the recipient had to visit the website and input their cards code. Two people won £50 to spend in high street stores, with everyone else winning between £1 and £5. Making false statements can be very damaging, especially in today’s digital age as lies can be easily uncovered and exposed to the masses. Don’t make claims about special offers, if the prices quoted are your everyday prices. Testimonials need to be from real customers and always have a believable, trustworthy message. 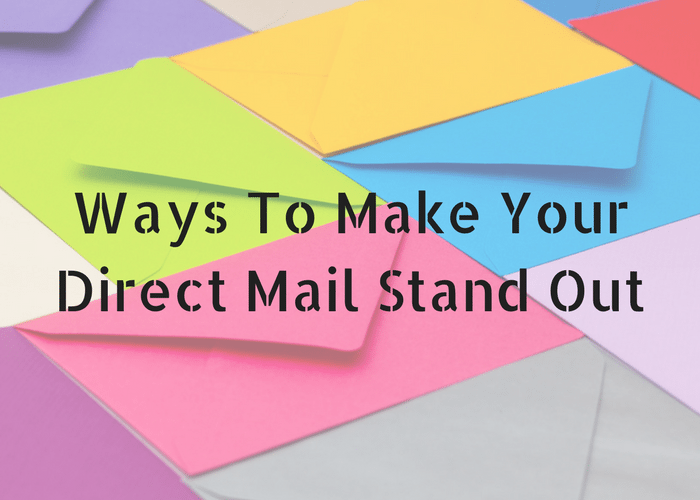 Your piece of direct mail should reflect your business. It needs to be well thought out, of high quality and printed on good quality paper. It’s an invitation after all– a bit like a wedding invitation or invite to a prestigious event. If you choose cheap print and paper, it might cost less but will bring in less too, as is more likely to be discarded and the quality of your print will reflect on the quality of your products or services. The paper you choose can also convey your overall message, an approach taken by World Water Day, which sent out a mailing with a message that could only be read when the paper was held under water. It demonstrated how water is the source of all knowledge. You don’t want your direct mail to look like junk mail, so avoid using explanation marks, all capitals and talking down to your audience. At the same, don’t assume that your audience knows a lot about your business. The copy in your piece needs to be well written, crafted by a copywriter who’s experienced at writing direct mail and can get the call to action just right. The person reading the piece should feel like you’re talking directly to them, so personalisation (addressing them and their company by name) can help with this. Writing for direct mail is a skill, and if you don’t have someone experienced in-house, you may need to look externally and turn to a marketing agency. The same goes for the design of the direct mail, you need a graphic designer who packs a punch. When a car showroom was opening in Liverpool, they targeted 100 people, sending them a box containing a red foil heart balloon with an invite to the opening attached to the balloon’s ribbon. This will have certainly grabbed their attention. A postcard instead of a letter, removes a barrier (an envelope), but might not have the same cachet as a hand addressed envelope. The format you use will depend on your business, target audience and what your message is. Colour is also important, as it is more eye catching than black and white, but too much colour can be overpowering (and expensive). Think about the colours you choose, do you want colours that excite, colours that are relaxing, colours that match your branding? Metallic colours and foil stamping are a good choice if you want to make your mailing to look luxurious and prestigious.